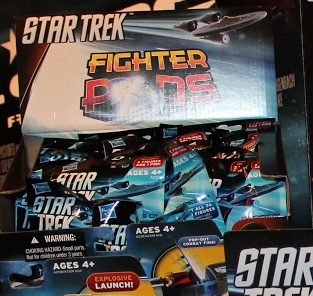 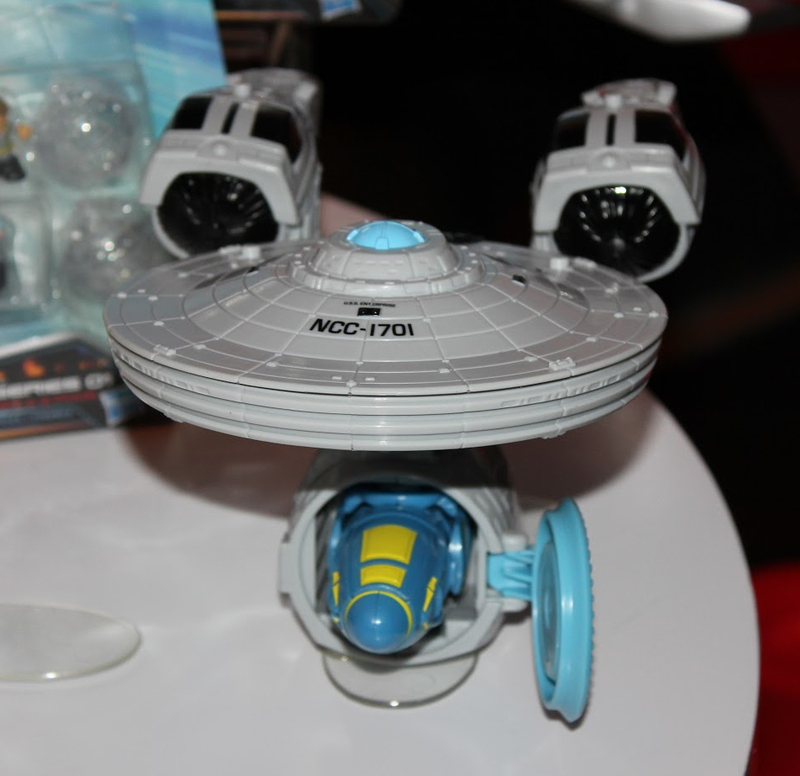 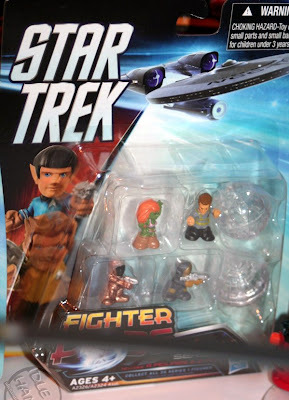 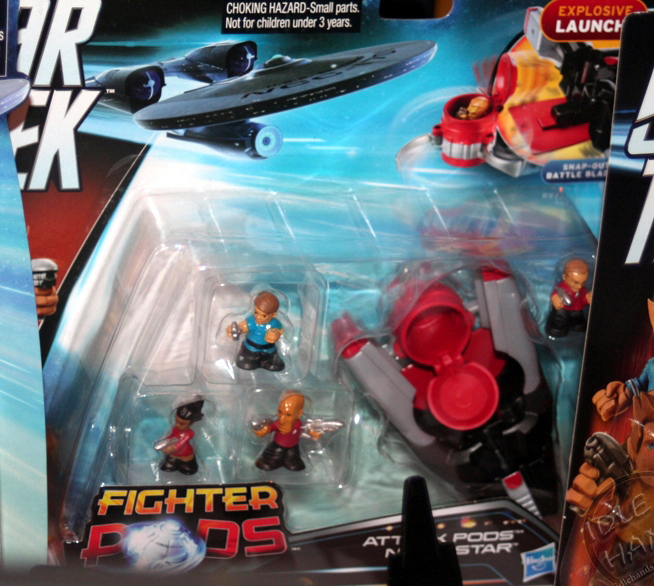 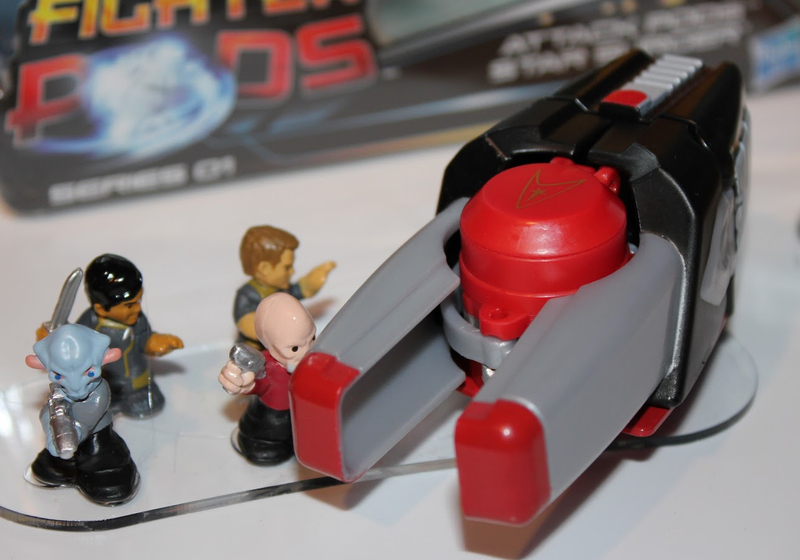 Announced along-side the Star Trek Kre-O range Hasbro have also been showing off what seems to be their only other Star Trek Into Darkness toy range at the Toy Fair, the Star Trek Fighter Pods game. The Fighter Pods will be available exclusively at Toys'r'us, and are based on the same game already available in a Star Wars variety, featuring miniature stylised figurines, and "pods" which the figures can be put inside of, on top of, or just be knocked over with. 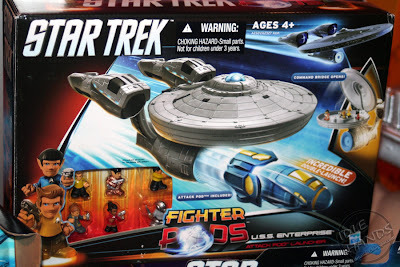 The pods also connect, and can be launched from model ships. 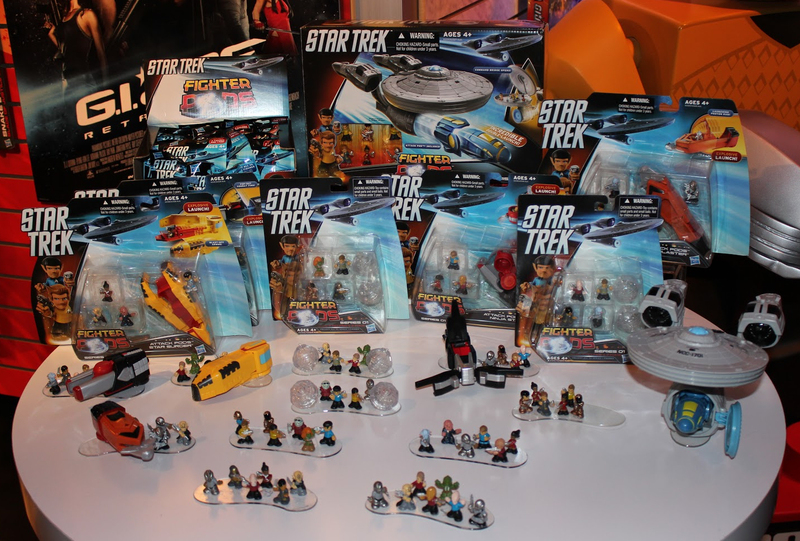 Like the Star Wars range, the new Star Trek line will offer lots of different characters, and variants, in sets of a variety of sizes ranging from a a handful of figurines and pods, up to large vehicle sets - This format gives the game an inherent collectability, and also allows you to play it at any scale, with just a few figurines, or with massive armies. 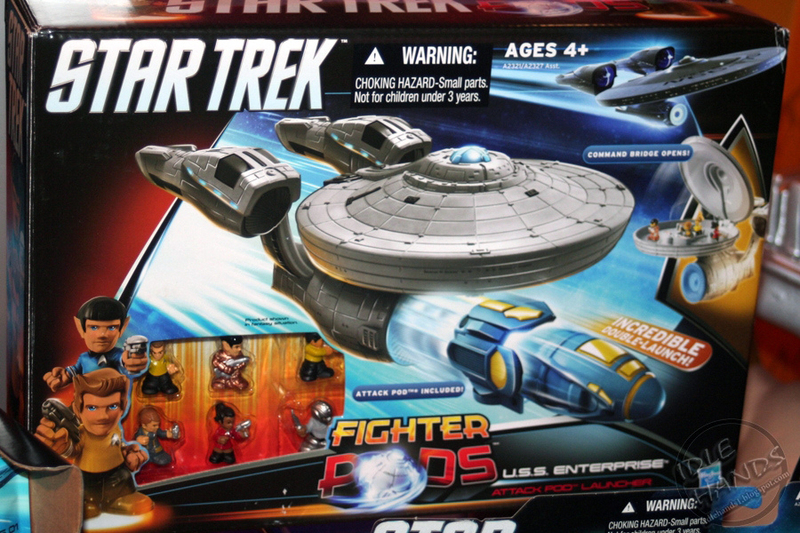 The next sets down are a collection of four different "attack pods", similar to the one included with the Enterprise set. 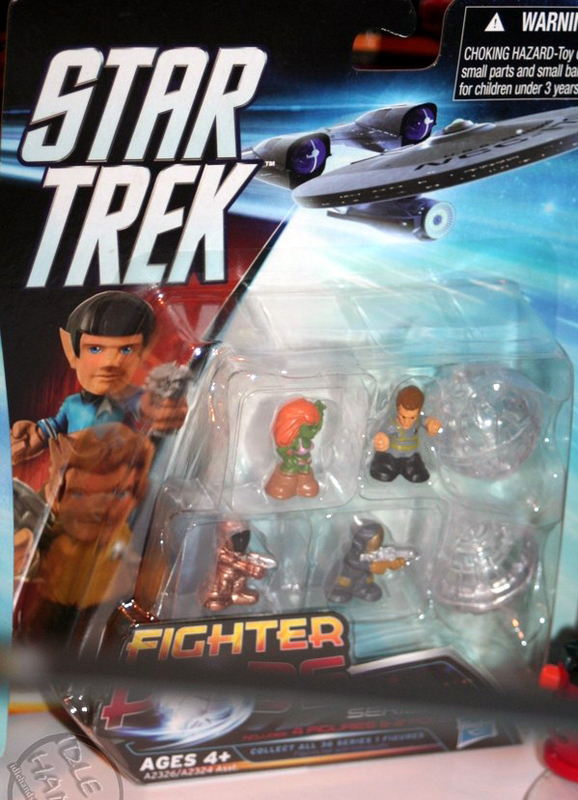 Each comes with four figurines, are used to launch individual characters "explosively". 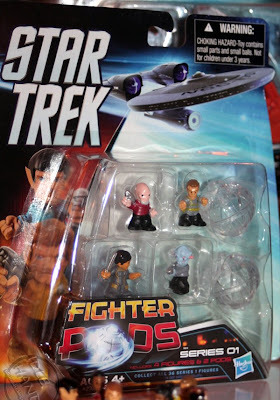 These have to be the biggest missed opportunity in the range; where the Star Wars series gets caricatured versions of fighters and other small ships to launch pods, the Star Trek range has this collection of generic devices with equally generic names, which don't really relate to Star Trek at all. 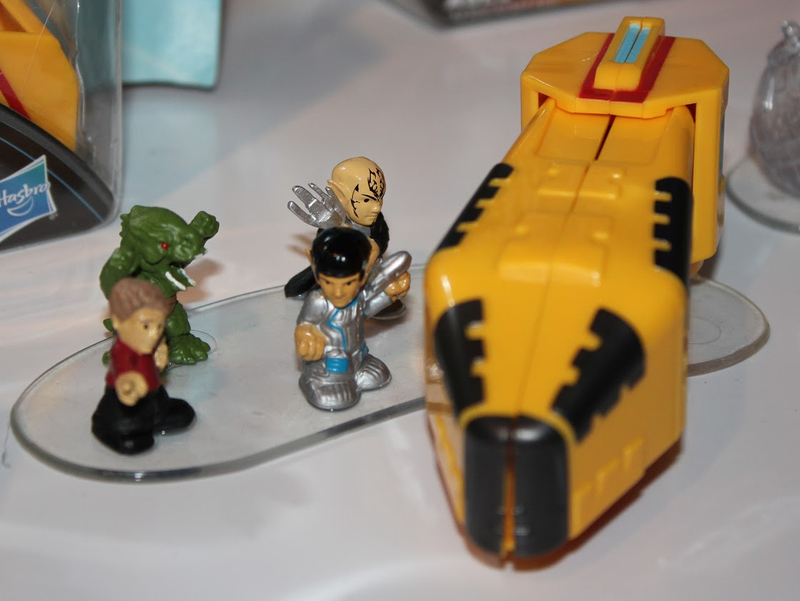 Star Surger - A bright yellow thing with "blast-off armor", revealing a red sled which a figurine can be propelled on. 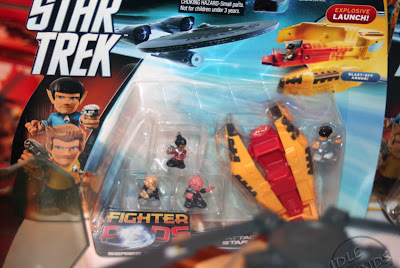 Comes with Spock and Uhura in a silver edged uniforms (possibly the wet suit variant from Into Darkness), Ayel (Nero's first officer), and Quocch (the many-faced alien from deleted scenes/the Nero comic). 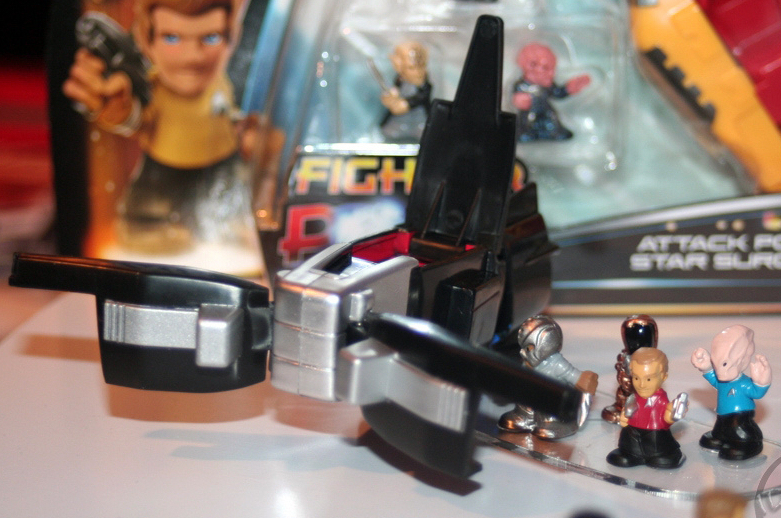 Ninja Star - Black and red design which launches its figurine in a little canister with a "snap-out" mechanism. 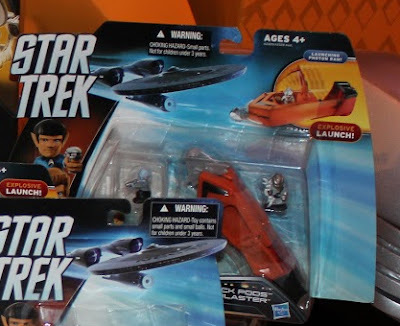 Comes with Scotty, McCoy, and Uhura, plus the alien with the long face (from the bar scene in the 2009 film), all in standard uniform. Phantom Striker - A black and silver design. The packaging is obscured in all the images I can find so far, so the figures are a mystery! Image sources: Elkkthunder's Toy Room, Idle Hands Blog, Toy News International.